Gary Donnan will join Eutelsat Communications (Euronext Paris: ETL) on 29 October as Chief Innovation Officer, reporting to Chief Executive Officer Rodolphe Belmer. In this role, Gary is tasked with defining Eutelsat's innovation roadmap and the identification and cross-functional development of innovation initiatives across the Group. Leading global satellite operators – Intelsat (NYSE: I), SES (Euronext Paris: SESG), Eutelsat (Euronext Paris: ETL) and Telesat announced today the creation of a consortium called the C-Band Alliance, or CBA, in a move that could accelerate making mid‐band spectrum available for 5G services. 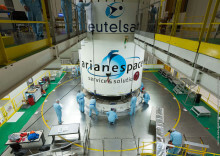 Launch and pricing by Eutelsat S.A. of a €800 million 2.000% percent Eurobond due 2025 to refinance January 2019 Bond. Positive impact of approximately €24 million per annum on financial charges contributing to Free-Cash-Flow maximization. Arianespace and Eutelsat Communications (NYSE Euronext Paris: ETL) have concluded a long-term multiple-launch service agreement on the occasion of the World Satellite Business Week in Paris. The agreement covers five launches until 2027 and will provide Eutelsat with assured access to space with schedule flexibility at cost effective prices. Philippe Oliva is appointed as Executive Vice President of Sales and Products as of September 3rd, 2018. He will report to Michel Azibert, Deputy CEO and Chief Commercial & Development Officer, with a view to succeeding him as Commercial Director during the course of 2019. Michel Azibert will continue to serve as Deputy CEO. 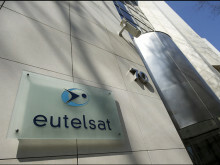 Eutelsat has sold its interest in the EUTELSAT 25B satellite operated at 25.5 degrees East to the co-owner of the satellite, Es’hailSat, for a consideration of €135 million.